So, he gave us directions to Glen Lyn, Virginia, which is right across the border from Princeton, West Virginia, and Karen and I drove there and met Henry Reed. We had a great session. I recorded about forty tunes that evening, and at least half of them were tunes I’d never heard before. Not because he made them up, but because he’d preserved this great old Virginia repertory that virtually everyone else had forgotten. He had it all, he played all those tunes, actually hundreds of them. It was an amazing experience! He must have been about eighty-one. He was born in 1884 and died in 1968. That meant that he learned his repertory from long before radio and records. In fact, he had already learned a lot of music by the turn of the century. He was also one of those musicians who acquired tunes wherever he went. He would play any tune that he liked, and so he added new tunes and didn’t forget the old tunes. He had a magnificent repertory. I recorded six or seven sessions with him, and at the last one, he had twenty more new tunes. We weren’t anywhere near the bottom of his repertory. A lot of the tunes he played were included in a collection called Virginia Reels, published by a Virginia music master in 1839. This is one of our only windows into what fiddlers were actually playing in early 19th-century America. And Henry Reed was playing about half the tunes in that collection; this was the grand old Virginia repertory, going back to the late 18th and early 19th century. It was brought into the Appalachians by Virginia settlers who moved there in the 1840s. His own mentor, Quince Dillion, was born in 1826 and moved up with his family from the Danville, Virginia, area, up into the mountains in the 1840s. That gives you a sense of how deep that tradition is. 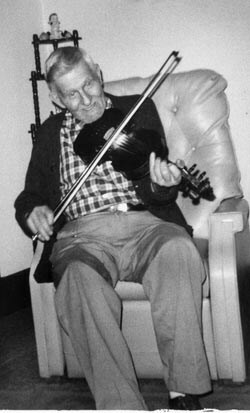 Quince Dillion played fiddle, but he also played fife before and during the Civil War. This man was born in the Jacksonian era, and died in 1903, but before he died, he taught a lot of music to Henry Reed. I like to see myself at the end of a long time-line, from today, 2012, going back to 1826; and right there in the middle is this man Henry Reed.